Get to savour free* homemade signatures from 20 Dine Inn hosts, watch live cooking demonstrations featuring “culinary treasures” passed down generation to generation, and participate in a Decorate Your Own Cupcake workshop. Visit the Esso LPG booth to take an instant photo and bring home an exclusive Esso LPG trolley bag^! Hurry, for the first 200 participants, while stocks last. Homemade signatures from our hosts include Pulled Pork Rendang Penne, Durian Crème Brûlée, Mutton Bistik and more. 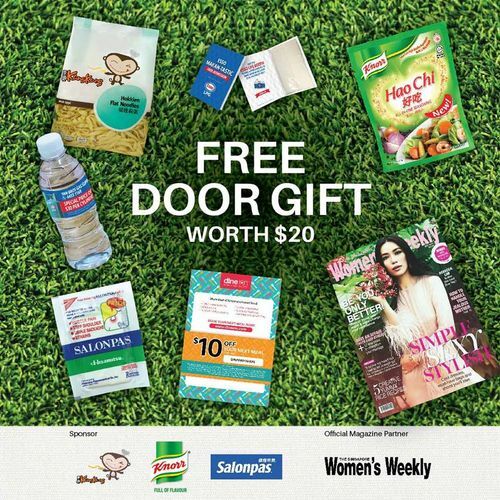 Also, bring home a free door gift (worth $20) filled with the following items: Dine Inn Voucher, The Singapore Women’s Weekly Magazine, Knorr Hao Chi Seasoning Powder, Salonpas® Pain Relieving Patch Sample and Kang Kang Noodles. Win attractive prizes during our stage games as well! To find out more, visit our Dine Inn booth at the event. Note: Pre-event registration entitles one person to a set of complimentary food coupons (3 pcs per set) and a door gift. Queuing is necessary to enter the event. *Limited to the first 800 participants. Participants who signed up must redeem their complimentary food coupons at the Dine Inn booth before 1pm at the event. Other Terms & Conditions apply. ^Terms & Conditions apply. While stocks last.